Definition of Sole Proprietorship Sole Proprietorship is neither a company nor a corporation but a business exclusively owned by an individual. If a person owning any products or services starts selling it, then he/she becomes a sole proprietor of that particular business. 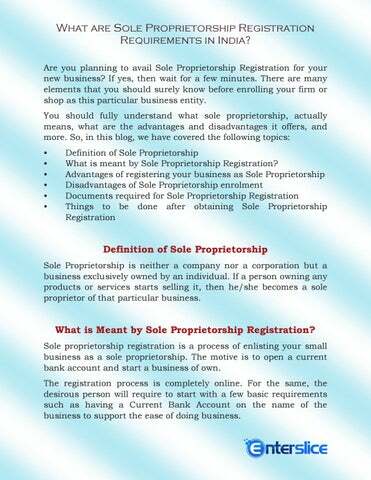 What is Meant by Sole Proprietorship Registration? Sole proprietorship registration is a process of enlisting your small business as a sole proprietorship. The motive is to open a current bank account and start a business of own. The registration process is completely online. For the same, the desirous person will require to start with a few basic requirements such as having a Current Bank Account on the name of the business to support the ease of doing business. Many people tend to confuse sole proprietorship with one person company limited. However, there’s a huge difference between a sole proprietorship and One Person Company. Similarly, there are a plethora of benefits that sole proprietorship business offers. If the business fails, the personal assets of the owner can be seized by the court; Because of unlimited liability, banks, investors, and other financial institutions fear to provide any loan; Limited resources are available; Because of the lack of competent people, things may lead to mismanagement and poor decision; Lack of expert eye in the business, etc. An Aadhaar card; A PAN card; Current Bank Account; and Registered office proof. During GST registration, use HAC/SAC carefully; Subscribe with Enterslice services, the best consultant in the market, for GST Returns Monthly / Quarterly Club your all business and other income in your Personal income tax return. Final Words Hence, if you're planning to set up your business as a sole proprietorship then do keep the advantages and disadvantages into consideration. If you think you should definitely go with it, then get the Sole Proprietorship Registration done to avail the advantages being offered. Contact Enterslice. 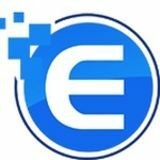 We will help you with the easy registration and do it in the least possible time.